Check out the Safeway Just For U Coupon Center. 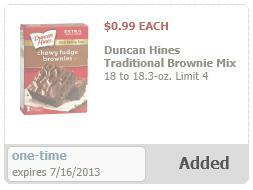 We have a new eCoupon for $0.99 Duncan Hines Brownie Mix. Combine it with the $0.35/1 Duncan Hines Product printable and you have free Brownie Mix.